Belize is home to the Antillean manatee (Trichechus manatus), a sub-species of the West Indian manatee. With an estimated population of between 700 to 1,000, it is the regional stronghold for this globally endangered species. However, the regional population is increasingly threatened, and even in Belize, it is declining. 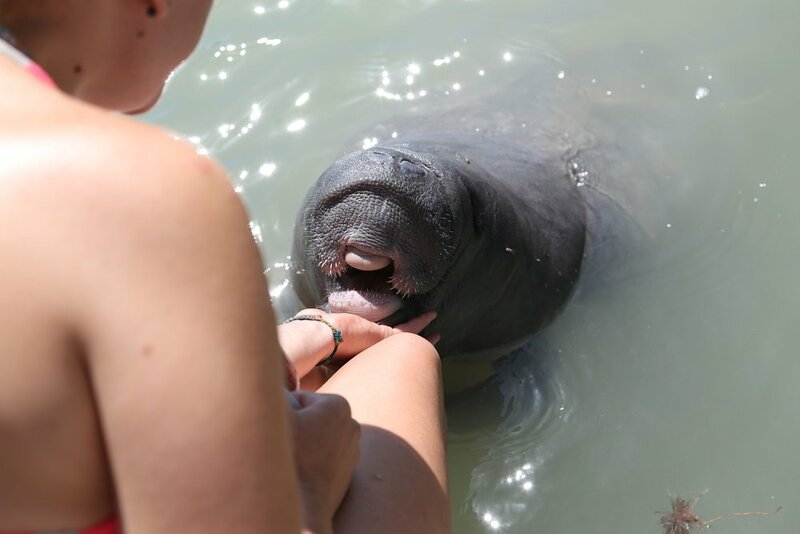 With the support of a network of manatee vets and biologists, the Manatee Rehabilitation Center has become well-known for its commitment and successes and now plays an active role in the sharing of skills and experiences of its approach. Why do manatees need rehabilitation? Manatees are facing increasing threats in Belize, particularly from increased boat traffic and watercraft collisions. Whilst the majority of animals do not survive such collisions, a small number of orphaned calves and surviving injured individuals are rescued, ad require rehabilitative care. As the only manatee rehabilitation facility in Belize (and in Central America), the Center accepts all injured and orphaned manatees needing care. With the wild population being so low, and the rate of injury increasing exponentially over recent years, it is important that where possible, rehabilitated individuals are returned to the wild population. WHAT HAPPENS WHEN A MANATEE COMES INTO THE REHABILITATION CENTER? The first 72 hours in care are critical... calves normally arrive dehydrated and emaciated, often with their skin stretched over a clearly visible skull and ribs. Even before arriving, during rescue and transport, the calf is offered rehydration solution. Once the calf arrives at the Rehabilitation Center, it is measured, weighed, and introduced into the Intensive Care Pool. This pool is small, with a water temperature maintained at between 28° and 30°C. The calf has constant contact with the carers, who sit on rotation in the pool for the first 48 hours (or until the calf is stabilized). The calf is continues to be monitored 24 hours a day, for at least the first week. Rehydrant solution is given every 2 hours by bottle, with the gradual addition of an elemental replacement milk formula. HOW DO YOU PREPARE A MANATEE FOR RELEASE? Young manatees need to be kept stimulated and active. As the manatee grows, time is spent encouraging it to develop normal manatee behavior and to eat manatee food. All manatees are provided with seagrass, which is collected fresh each day and placed on the base of the pools, fastened in a PVC frame. As the manatee calves grow, they are moved to larger pools, and eventually to the Lagoon Enclosure. Manatees learn by watching their mothers – carers swim with calves to seagrass beds within the lagoon enclosure, encouraging the calves to investigate. The lagoon enclosure allows larger calves to learn about natural water flows, changes in salinity and temperature, to seek shade and shelter under overhanging mangroves – and to move in relative freedom. Once old enough, the calves are fitted with a satellite tracking device and enter soft-release – living free in the lagoon. They are introduced to the seagrass beds, and constantly monitored remotely using the saterllite information. This stage continues for up to a year – the extended soft release process is critical in the preparation for a successful reintroduction to the wild. It provides time for them to not only learn about the wild environment, but also to be are gradually weaned off human dependence. To date each manatee that has been successfully rehabilitated and released from the Centre has survived well and integrated into the wild manatee population. Our first manatee, Woody, has been wild now for over 17 years, and when last seen ten years after release, was thriving. Raising and rehabilitating manatee calves is only possible through the assistance of volunteers. With no national funding available to support manatee rehabilitation, the success of the program relies on committed volunteers. Volunteering can be wet, smelly hard work (especially on night shift with young calves)... but, also extremely rewarding. Volunteer placements are for a minimum of one month and more often for two or three months or more. We have volunteers who extend their stay with us for up to six months and others who keep coming back. Get in touch to discuss volunteer opportunities! Depending upon their age and condition, each manatee can consume between US$8 and $15 worth of milk formula daily. The Manatee Rehabilitation Center is entirely dependent upon donations… for feeding the manatee calves, for the necessary expansion of facilities to meet the increasing demand as an increasing number of manatees are injured or orphaned, and for outreach and awareness activities designed to tackle the root cause of the problem. The development and extension of facilities, and additional support for individual calves, have been supported by a number of organizations and individuals, including Busch Gardens, Oak Foundation, the Protected Areas Conservation Trust, Save the Manatee Club, Sea-to-Shore Alliance, Sirenian International, and private donations. However, with the increasing number of manatees requiring rehabilitation, additional funds are always welcome.